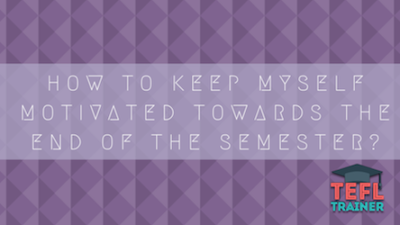 How to keep myself motivated towards the end of the semester? Teaching English is a fun experience as you get to meet a variety of people and have interesting discussions. As well as meeting other teachers from UK universities, some of whom may even go to the same university as yourself! As the end of term draws closer though you may find that your motivation to continue falters. I have found this as Christmas is approaching. I’m looking forward to being home for Christmas and, this may be a very ‘studenty’ thing to say, but I’m looking forward to having decent food made for me and have a fully stocked fridge. I have found that some of my lessons have become repetitive when looking at the General English sessions. About two weeks before the end of the semester I realised that I have to do something to change it up and keep myself motivated. There are many different articles on the internet that have suggestions on how to stay motivated. Having a look many websites suggest that taking some time for yourself is a good idea, mixing up lessons to add a new dynamic to teaching and some even suggest just faking it! The suggestion of taking time out is a good one in my point of view. I was fortunate enough to be able to take a trip with two friends through their university. So, taking advantage of the many Spanish bank holidays at the beginning of December, I was able to be on holiday for 5 days. This definitely helped me feel ready to tackle the final two or so weeks. Something that I found in lessons as well to keep myself motivated was to ask to hear the students’ opinions more often. Rather than strictly following the reading comprehension exercises. This meant that I had many more interesting discussions rather than hearing the same text over and over again. I also found that it was beneficial for the student as it meant they had to develop sentences to express themselves much more than just repeating words or sentences. In conclusion, I found many articles that suggest good ways to stay motivated. However, often they suited different personalities and I didn’t find something that perfectly suited me. Until I started to change my lessons. Just this little change made it much more interesting for me and meant that I could stay focused during the lessons as I am genuinely interested in what the students have to say. Plus, I think the holiday helped a little bit!